Some of Alaska’s most prominent lobbyists are boosting the fundraising efforts of political candidates – a practice that, according to a top enforcement official, appears to violate a state law that’s designed to limit lobbyists’ influence over the legislative process. In the past year, lobbyists Ashley Reed and Jerry Mackie have emailed clients and friends invitations to political fundraisers for candidates including Gov. Bill Walker, House Speaker Bryce Edgmon and state Sens. Kevin Meyer and Lyman Hoffman, both of whom sit in Senate leadership. That’s in spite of a state law that bars lobbyists from helping with legislative and gubernatorial candidates’ fundraising efforts. Penalties for violations include a fine capped at $1,000 and up to a year in prison. 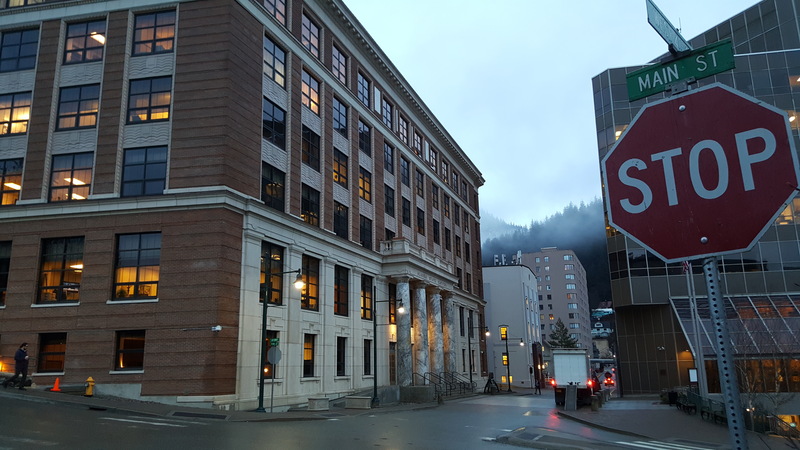 Both lobbyists said they received permission to send the invitations from the state’s lobbying enforcement agency, the Alaska Public Offices Commission. But the commission’s director, Heather Hebdon, said one of her employees had only issued non-binding, informal advice that won’t protect lobbyists against a complaint. Lawmakers approved the fundraising ban in 1992 as an anti-corruption measure, according to one of the advocates for the ban, former state Rep. David Finkelstein. When lobbyists help raise money for politicians’ campaigns, it can give them more leverage when they ask those politicians to vote in a particular way, Finkelstein said. Before the Legislature approved the ban, lobbyists were allowed to participate in political campaigns. And lawmakers often pressured them to help with fundraising, Finkelstein said, since many lobbyists’ clients are business and industry leaders who can write big checks. 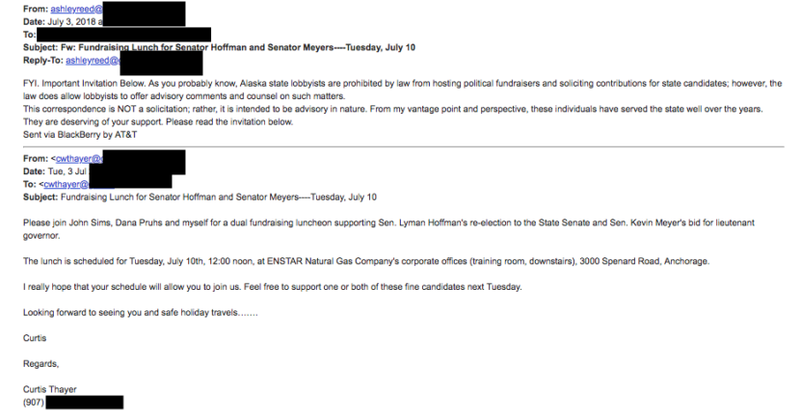 The law that Finkelstein helped pass says lobbyists can’t “directly or indirectly collect contributions” for candidates, and they can’t “otherwise engage in the fundraising activity of a legislative campaign or campaign for governor or lieutenant governor.” State regulations implementing the law say that lobbyists can’t solicit, collect, accept or deliver campaign funds or goods. Reed and Mackie represent some of the state and country’s largest corporations, plus a slew of nonprofits and tribal organizations. Each makes more than $700,000 a year to push the interests of their clients in the state Legislature and with executive branch agencies. In July, Reed – whose 15 clients include CVS Health, Wells Fargo Bank and Enstar Natural Gas – forwarded an emailed invitation to a fundraising lunch for Hoffman and Meyer. The event was held at Enstar’s Anchorage offices. The original invitation was written by one of the co-hosts of the lunch, Alaska State Chamber of Commerce President Curtis Thayer. Reed added his own message. Reed has also sent invitations on behalf of two Anchorage Republicans – Josh Revak, who’s running for a state House seat on the lower Hillside, and incumbent Sen. Mia Costello, according to copies obtained by Alaska Public Media. Mackie, meanwhile, last month sent an email that attached an invitation to a fundraiser for Hoffman and House Speaker Bryce Edgmon. Mackie, whose 20 clients include AT&T, Arctic Slope Regional Corp. and cruise line Holland America., did not write a message of his own. He also texted invitations last year to a fundraiser for Walker and to another event jointly benefiting Hoffman and Edgmon, according to a copy of the texts obtained by Alaska Public Media. In phone interviews, Reed and Mackie both said they thought their activity was authorized by the public offices commission. Mackie cited a legal interpretation he asked for last year from an employee at the commission, also known as APOC. The law contains a caveat that allows lobbyists to “personally advocate” for candidates in spite of the fundraising ban, Dalberg wrote. “Informing others of upcoming fundraisers for a candidate that a lobbyist personally supports is not prohibited,” she said. Reed said he did not have any written guidance like Mackie’s. But he said he’s received similar advice in phone calls with commission employees. Any guidance that the lobbyists received from commission employees won’t insulate them from complaints, though, according to Hebdon, the commission’s executive director. Hebdon said information from phone calls like Reed’s, and even from a letter like Mackie’s, is non-binding, “informal advice” from staff that hasn’t been approved by her agency’s politically-appointed commissioners. The lobbyists could have asked the commissioners to issue a formal advisory opinion, Hebdon added. And she said she interprets the law differently from Dalberg, her employee who wrote the letter to Mackie. “A plain reading of the statute clearly prohibits anything to do with fundraisers,” Hebdon said. It’s pretty clear, she added, that lobbyists are barred from sending invitations. Reed and Mackie both said they would stop sending emails if Hebdon’s agency asks. “If the commission says we’re not supposed to do that, I won’t do it and I doubt any of the other lobbyists will do it,” Reed said. After the lobbying law was approved in the 1990s, the public offices commission addressed several formal requests for advisory opinions from lobbyists who wanted to understand the limits of the fundraising ban. But even after those opinions, the differences between allowed and illegal activity are still subtle. Lobbyists can’t work with a candidate or campaign staffer to determine the details of a fundraiser. But they can do limited “clerical” work to help clients, like businesses, that are organizing fundraisers, the commissioners said in a 1994 ruling. When asked, the commissioners couldn’t agree on whether it’s legal for a lobbyist to prepare a list of guests that their clients would use when sending fundraiser invitations — though the commission’s staff recommended that such activity be considered illegal. The commissioners have never issued an opinion directly addressing whether it’s legal for lobbyists, under their own names, to send invitations to fundraisers in email or text messages, like Mackie and Reed did. Reed described that practice as commonplace among lobbyists. He also said that legislators running for re-election often ask him to distribute invitations to their fundraisers. “When they ask for a favor, you try to help them,” Reed said. Four of the candidates whose fundraiser invitations were emailed by the lobbyists — Edgmon, Hoffman, Walker and Meyer — didn’t respond to requests for comment. Revak and Costello, whose fundraiser information was emailed by Reed, both said they didn’t asked him to do that. Previous articleDonlin gold mine needs to move a mountain. How close is that to happening?